Honeyview is very fast image and archived image viewing software. Honeyview can open common image formats including BMP, JPG, GIF, PNG, PSD, DDS, JXR, WebP, J2K, JP2, TGA, TIFF, PCX, PNM, and PPM. RAW formats such as DNG, CR2, CRW, NEF, NRW, ORF, RW2, PEF, SR2, RAF, WebP, DDS, PCX, and PNM can also be opened. It also allows viewing an archive without extraction - ideal for manga and cartoon viewing. Supported archive formats include ZIP, RAR, 7Z, LZH, TAR, ALZ, and EGG. Images can be viewed in various modes such as Fill and Parallel View. Slideshows are also supported with various transition effects. 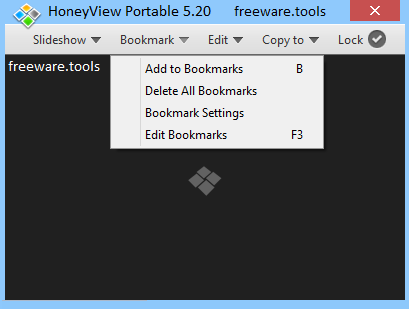 This it the portable edition of HoneyView, a small, free and portable image viewer that supports many popular file formats, and bundles some handy photo managing and processing tools. As there is no setup pack involved, you can put the program files in any part of the hard disk and just click the executable to run. Another possibility is to save a copy of the tool to a USB pen drive or other mass storage device, to be able to run it on any workstation with minimum effort and no prior installers. What's more, HoneyView Portable does not create new entries in the Windows registry or Start menu, leaving the disk clean after removal. The GUI has a pleasant aspect, allowing users to open images with the file browser or drag-and-drop support. As far as viewing options are concerned, it is possible to stretch small images, fit pics to the window or to width, view their original size, as well as to enable “Smart Double Page” (left to right, or vice versa). To meet users' entertainment needs, HoneyView implements a feature for creating a slideshow from all selected pictures, letting them select each slide's duration, enable repeat or shuffle mode, as well as apply a flip, fade or slide effect. Advanced users may inspect EXIF information and pick the interpolation method, among others. Favorite pictures can be bookmarked for easy access at a later time. Some basic image viewing controls are included, such as zooming in and out, or rotating pictures left or right. In addition, the files can be copied to any two other locations (defined in advance by the user). In matter of editing features, the application is capable of setting an image as the desktop wallpaper, copying it to the Clipboard, opening it with an external image editor, as well as converting pictures into other formats (e.g. JPG, PNG, auto) with a new orientation, size, quality and file name. The tool used low-to-moderate RAM and low CPU during our evaluation. To sum it up, HoneyView sports an impressive range of features dedicated to image viewing and processing. Its learning curve is decent, making the tool accessible to all user categories.